My obsession with Subaru’s failed F1 engine, a flat-12, has gone on for years, and I had often heard that the motor nearly went on to power Koenigsegg’s first supercar. Now I’ve finally heard the full story. I should have heard this a year ago; that’s when Christian von Koenigsegg first explained it. But I missed it tucked away on Koenigsegg’s own blog. I’ve been busy listening to how the totally-not-a-Bond-villain Swedish supercar genius has been explaining why gravity works backwards, why camshafts don’t need to exist and other technical points. In any case, here’s as much of the history as I can explain. Back in the late ‘80s and early ‘90s, the Japanese economy was in something of a bubble period and Japanese carmakers were on a tear developing some of the most extreme and fantastically pointless cars in modern history. In the world of road cars, we’re familiar with how Honda took on Ferrari with the NSX and how Toyota took on Mercedes with Lexus. The stories from racing are a bit more arcane. We do remember Mazda’s victory at the 24 Hours of Le Mans with a quad-rotor Wankel engine, but few recall how Subaru briefly entered Formula 1 with a flat-12. It was a 3.5-liter naturally aspirated engine designed by the Italian legend Carlo Chiti, who had designed the flat-12s that powered Alfa Romeo to a pair of world constructor’s championships all the way back in the mid 1970s. This Subaru-branded engine was at the tail end of Chiti’s career, and it was never successful. It weighed too much, didn’t make enough power, and its wide flat design meant that it compromised the aerodynamic underbody shape of the Coloni F1 car it was built for. The engine was so bad, it never even qualified for the starting grid at an F1 race. It was ultimately abandoned before its debut year was over, with a string of firings in its wake. Most histories of this engine explain that the rights to the design got bought up by Koenigsegg at the end of the decade, but few explain exactly how that all worked. I assumed it was a speculative purchase that never went very far for Koenigsegg. I was wrong. Christian von Koenigsegg himself explained how close he came to running the engine in his first production supercar last fall in this ask me anything-style blog. Koenigsegg said that he met a friend of Carlo Chiti’s in the mid ‘90s, a few years after the Coloni-Subaru F1 effort flopped. This was also right after Koenigsegg’s deal to use tuned Audi V8 engines, like the one in his first prototype, fell through. 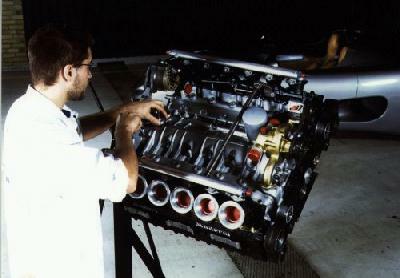 Finding any good picture from Koenigsegg of their work on this engine is difficult. I spotted this picture of an engineer working on a full engine with what looks like a CC prototype in the background and I found this picture of an engine mounted in a Koenigsegg car, complete with extremely wonderful multicolored tennis balls protecting the individual throttle bodies. I couldn’t find any full pictures of the outside of this running Koenigsegg prototype at all. So there are still a few mysteries surrounding this incredible engine that never was. I would have loved to have heard it run.